How Can Playing the Didgeridoo Help? Do you, or someone you know, have sleep apnea ? If so, then the Didgeridoo Club might just be for you! Beginners to more advanced club members meet once a month to learn the basics about playing the Didgeridoo. We listen to famous Didgeridoo pla yers and break down the different steps required to achieve a circular breathing pattern. According to research in the American Journal of Respiratory and Critical Care Magazine, tongue and pharyngeal muscles used while playing the didgeridoo reduce symptoms of sleep apnea. 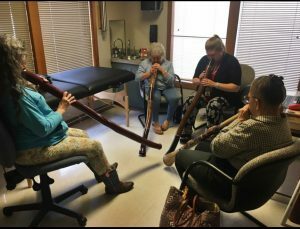 Playing the didgeridoo is also helpful to those who have a respiratory ailment or a physical disability limiting the ability to exercise the respiratory muscles. The didgeridoo, an Australian aboriginal tubular wind instrument, (if played on a daily basis) can improve respiratory strength and thereby decrease risk of stroke, heart attacks, and other ailments associated with sleep apnea. If you are, or someone you know, is interested in the club and would like to be put on the call list to remind you about the next meeting, please call our office at (541)-267-5221.
allan ledesma	2017-05-15T05:56:21+00:00	Comments Off on How Can Playing the Didgeridoo Help?